First, let me be very careful about the information I’m about to share. It will be easy for some to see this as either a loophole that can be exploited to reach the News Feed or a hard and fast rule about when you should post. What I’m sharing here is merely anecdotal based on what I’ve seen recently in my results. It’s a sign that Facebook may have tweaked something. Or it could be an unexplained phenomenon limited to my page. But I’ve heard enough from other page managers that I think there’s something to it. And regardless, there are reasons why posting in this way should be successful. For years, we’ve seen scores of reports proclaiming the best time to post. It could be at 8am on Monday, for example. But such reports were flawed in so many ways. First, they were based on a mash-up of data from different brands and users from around the world. What is good for me is not necessarily good for you. And time zone never seemed to be accounted for in these results. But that was the obvious weakness in proclaiming a “best time to post.” There’s another issue that most have failed to understand. These reports labeled a time “the best” because that’s when the most users were online. But in reality, this also creates the most possible competition at those times. If you post at 8am when the most people are online, that also gives your post the most possible competition. Facebook will then need to filter out more noise to show the posts that people will care about most. The result: You were bound to reach a lower percentage of people who were online at that time. While I do tend to use the “most fans online” time as a starting point for posting, it’s looking more and more like that’s not particularly effective. As you can see from this graph, my number of fans online is highest between about 6am and 3pm my time. There are an average of 17,518 fans online at that time. The least activity occurs between 10pm and 3am, when there are an average of 12,261 fans online (or 70% of peak activity). You’d expect that my results would follow accordingly. You’d expect my posts at peak-times to receive more reach and engagement than my posts at non-peak times. But lately, that’s far from the case. While I don’t obsess over Reach, this metric is the best starting point since I can separate paid from unpaid performance using Organic Reach. I can’t see, for example, how many people engaged when seeing my post organically vs. when it was an ad. So let’s take a look at the Organic Reach of my posts during peak times from March 12 through April 8 (27 total posts). Again, this is when there are an average of 12,261 fans online. I split this up according to post type since we know this can make a difference. As you can see here, links (8,574 average) and status updates (8,629) are reaching more people than photos (6,900) during peak times (6am – 3pm). Note that I have a strategy that includes sharing evergreen links late at night. Therefore, I’ve only shared links during non-peak times. 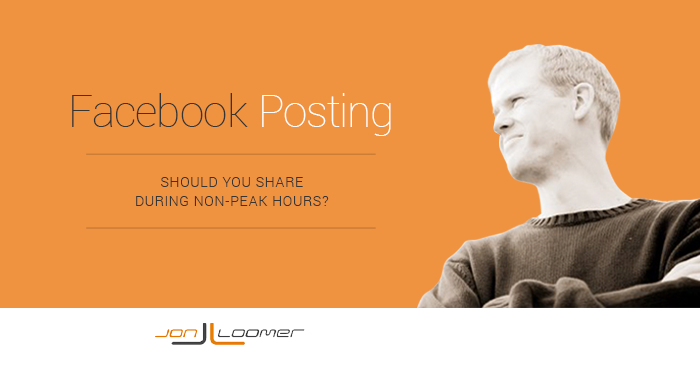 I shared just as many posts in this study during peak times as non-peak times (27). 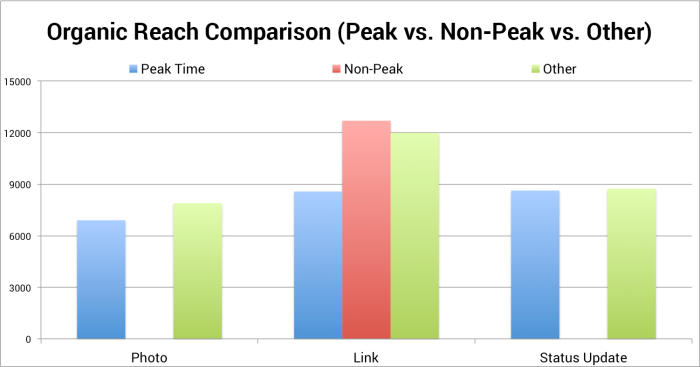 Notice I’m reaching more people with links during non-peak times (12,963 average) vs. peak times (8,574). Up until now, we’ve looked at the times between 6am-3pm and 10pm-3am. But what about the “other” times? 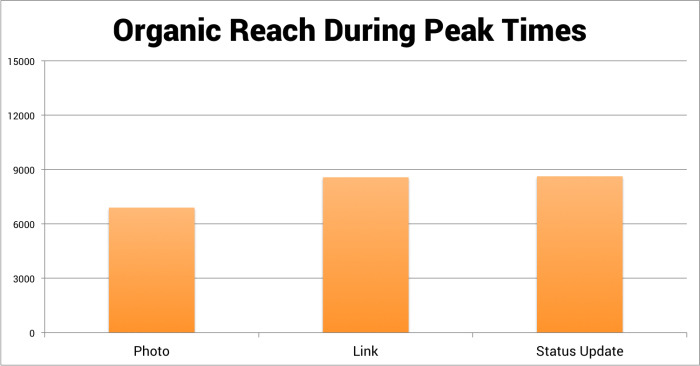 First, let’s compare Organic Reach by time period, side-by-side. As a reminder, I only used links during non-peak times. As you can see above, posts published during the peak times were consistently outperformed by posts published during non-peak or “other” times. This is despite the fact that only about 70% of the fans were online during the non-peak times. When I take a look at my top 10 posts by Organic Reach during this period, only one (#8) was posted during peak times. The post that received the most distribution was shared at 1:20am and reached 33,344 people. Remember: These late-night posts aren’t breaking news or shares of new blog posts. They are all re-shares of older, evergreen content. Now, I’d be foolish not to point out that Facebook has changed the way they report Organic Reach. In my mind, it’s now underreported when you promote a post. 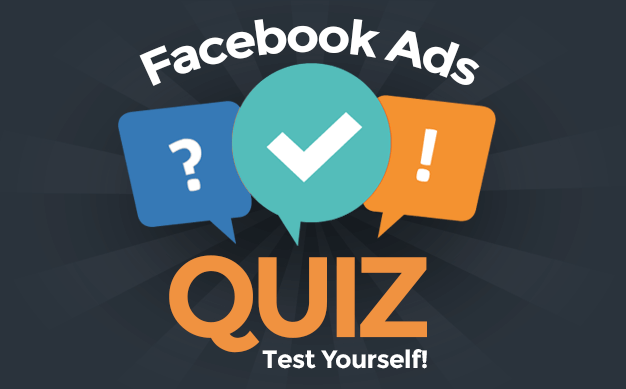 If you reach a user both organically and paid, Facebook only counts that person paid. Because of that, the Organic Reach numbers for any post that was promoted are a bit misleading. And since I promote most new blog posts that are shared during peak times, this is important to point out. Now, we all know that actions are more important than Reach. 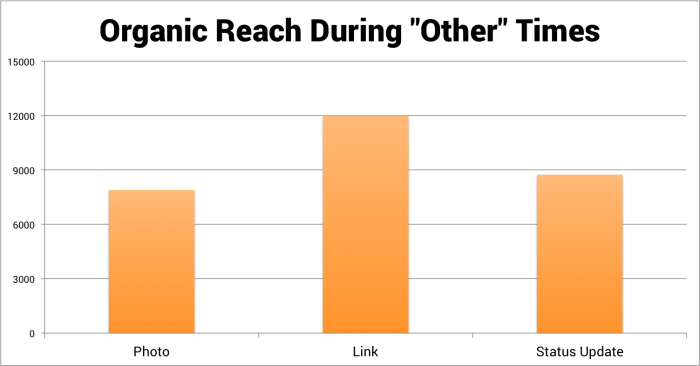 So I wanted to see how website clicks stacked up during these times whenever I shared a link. While the top performing post was shared during peak times, most of those people (10,904) were reached with an ad. 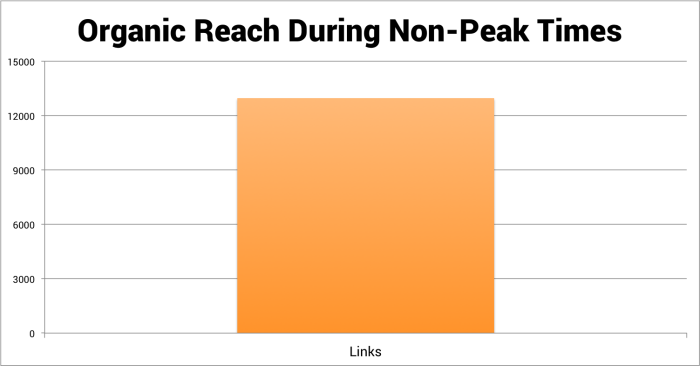 Only one more of these posts was shared during peak times, and that one generated the eighth most link clicks, though it didn’t receive promotion. I also find it interesting that neither of the two posts shared during peak times were published during the highest activity period (earlier morning) during those peak hours. It’s important to note that we’re dealing with relatively small sample sizes here. But it would be foolish to ignore the potential trend. One would expect that posts published when 30% fewer fans are online would not only reach fewer people but receive fewer desired actions. I am certainly not seeing that right now. A big reason for this is because I have an international audience. As a result, I don’t have the huge disparity of fans online during peak vs. non-peak times that many brands will have. So undoubtedly, that international audience is helping me. 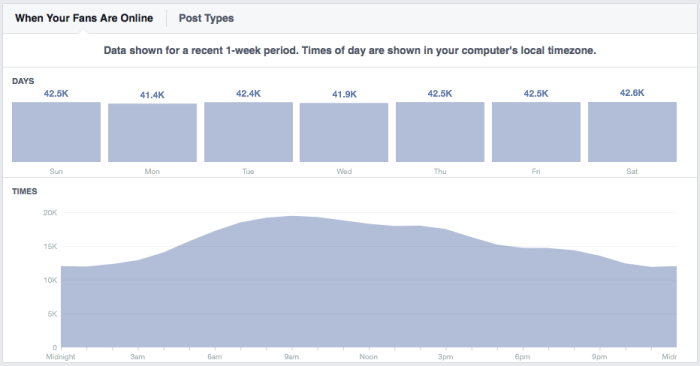 The typical Facebook user will have about 1500 potential stories on a given day. Facebook filters that down to about 300. Clearly, Facebook needs to do more filtering during peak times due to the competition level. If you post at times when you have fans online but there is less noise in the News Feed, the probability you’ll be filtered out decreases. But there’s an added benefit here: Story Bumping. I’m hearing more and more from my friends on the east coast that they’re seeing my late-night posts at the tops of their News Feeds when they get up in the morning. An easy explanation for this is that posts already have momentum because they were shown during low-competition times and received high engagement, so Facebook surfaced those posts in favor of other, newer posts published during peak times. Or so I think. It’s difficult — even impossible — to know for sure. But this is certainly something worth monitoring. Do my results mean you should start posting only at 2am? No. This is exactly what I want to avoid. If everyone suddenly starts posting at 2am, competition increases and the benefits disappear. It means you should look at the composition of your fan base and experiment. Always experiment! Have you seen similar results? Let me know in the comments below!